Becky Bucklin, Megan Miller, Brittany Bryant and Justin Benko were some of the most excited fans in the stands when the Colts took the field at Friday's event. Decked out in homemade shirts and bandanas and holding a sign, the group watched intently, cheering and taking pictures as one of their best friends performed. Friends from Peoria, Ill., the girls were in Normal for the drum major track of the Music for All Summer Symposium. 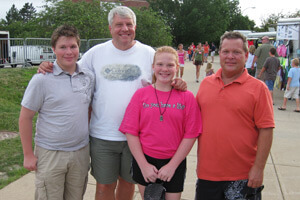 Jim Saus, and Don, Rissy and Kegan Myers, who traveled from St. Louis, Mo. 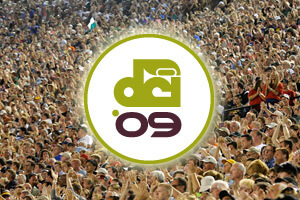 to take in the DCI Central Illinois event, pose for a picture in the marketplace before Friday's show. Rissy, who is involved in middle school color guard, was ecstatic to see color guard members from the top corps perform. Jim, whose son was a snare drummer with Phantom Regiment in 1995 and '96, said he was excited to see "a gathering of some of the very best corps in the country and the high level of competition." Ryan Gabet (far right) and fellow campers show support for the corps in the stands before the show. 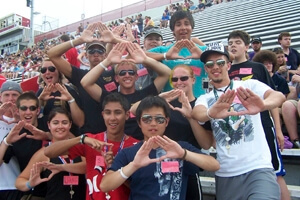 Gabet, who is from Fort Wayne, Ind., was attending the Summer Symposium drum major camp for the second year, and said he was really excited for the show. "I am hyped!" he said. "You learn so much, then you come back and learn some more" he said about the camp. "The intensity of 500 drum majors together is amazing."